It took a few visits to Paris but I finally got around to exploring Montparnasse & southern Paris. Between all the usual Parisian highlights, I always put off visiting this part of town but thankfully I got around to fixing that glitch! 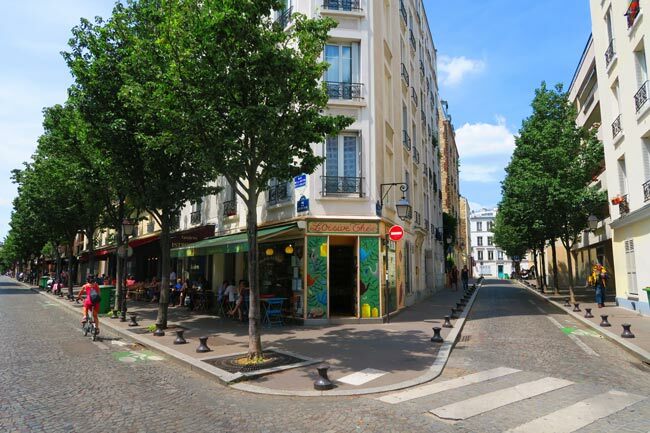 Montparnasse is a historic neighborhood in the 14th arrondissement (district), sitting on the ‘border’ between the chic Saint-Germain-des-Prés and the working class south. It’s one of the most scarred neighborhoods in Paris, with modern developments galore, yet there are still some pockets of old time charm – and that’s where we’ll head today! 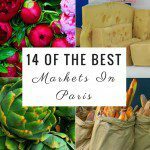 In this post, we’ll relive the magic that gave this part of Paris its fame, while visiting a number of culinary highlights, including one of the best food markets in Paris! 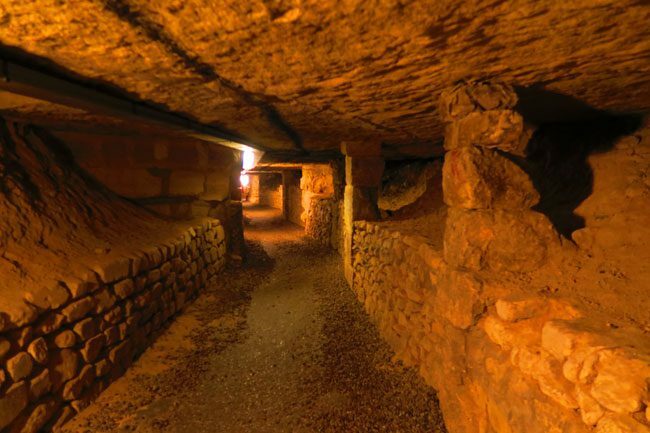 We’ll also head deep underground and discover Paris’s ancient secrets, finally heading south into the 13th arrondissement, to the hilltop quarter of Butte-aux-Cailles – where time seems to have slowed down. 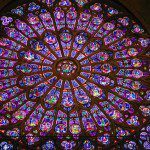 Exploring Montparnasse & Southern Paris – Why? 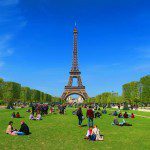 If you’re tired of the usual Paris sights, negotiating your way through the tourist crowds and want to see something off the beaten track in Paris – Montparnasse & southern Paris might be right for you! There’s a wonderful mix of new and old, working-class charm with bohemian cafes and one of the best food markets in all of Paris – are you convinced by now? Before you go: pick up your own copy of The Rough Guide To Paris (only $17 on Amazon), together with these neighborhood guides, it’ll be your best friend in The City of Lights. 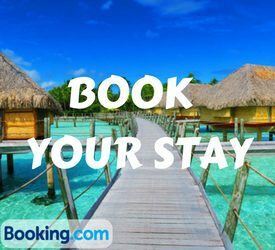 Other options: you can skip the visit of southern Paris and spend only a couple of hours exploring Montparnasse. 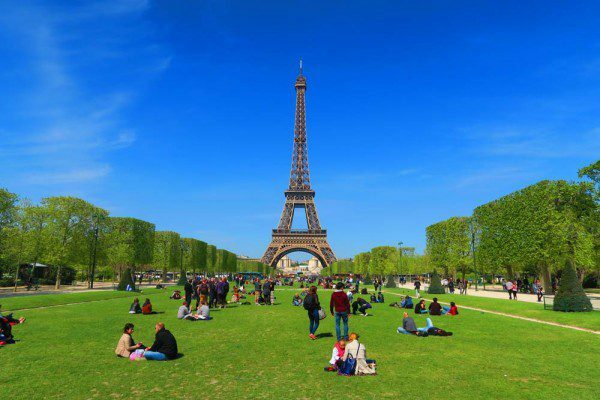 You can then walk to the beautiful Jardin du Luxembourg and spend the rest of your day in the classic Parisian neighborhood of Saint-Germain-des-Prés or the Medieval Latin Quarter. Montparnasse reached its heyday in the 1920s and ’30s, between the two World Wars. This exciting period of time in Paris is depicted in all those famous retro posters that you’ve probably seen. It’s known as les Années Folles (the Mad Years). During these years, Paris’s artists and intellectuals trekked across the city from Montmartre to settle in Montparnasse, in search of low rent. A little further south of Montparnasse, things were a bit different. Well beyond the Customs Wall, erected in the late 18th century to tax the flow of goods into the capital, the hilltop former village of Butte-aux-Cailles (‘the Hill of the Quails’) used the (now extinct) river to specialize in tannery and tissue trades. We’ll start our day with a visit to the legendary underground graveyard. You really need to get an early start! 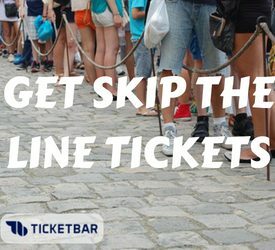 The Catacombs are open every day but Monday starting at 10 am and plan to arrive at around 9 am if you don’t want to waste a good three hours in line (you can now also buy skip-the-line tickets in advance)! Paris might look like a giant museum above ground but down below, it’s like a giant Swiss cheese. Centuries of underground quarrying have yielded the fine Paris Stone that gave life to many of the city’s finest monuments. 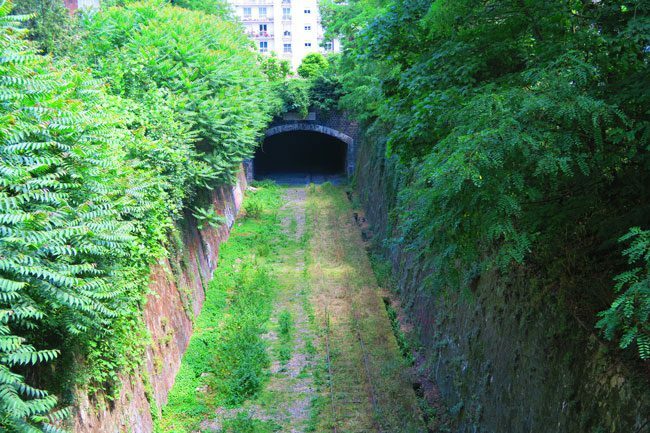 But it has also left it with hundreds of miles of unmapped, mysterious and dangerous tunnels. 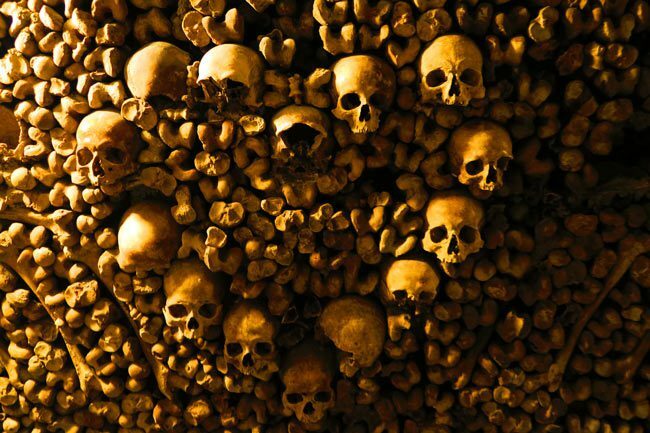 When the city’s overflowing cemeteries led to civil unrest that risked the king’s throne, he devised a genius (and dark) plan to spring new life into the abandoned tunnels. 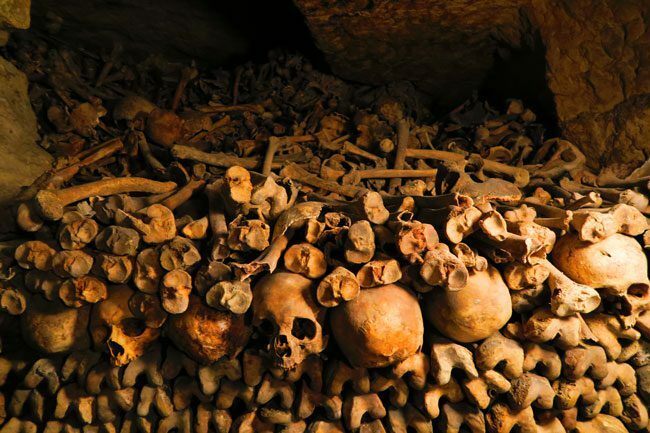 ‘New life’ is probably the wrong choice of words as over the course of a few decades, Paris’s cemeteries were simply transferred below ground, creating what is now one of the top attractions in Paris – the Catacombs! 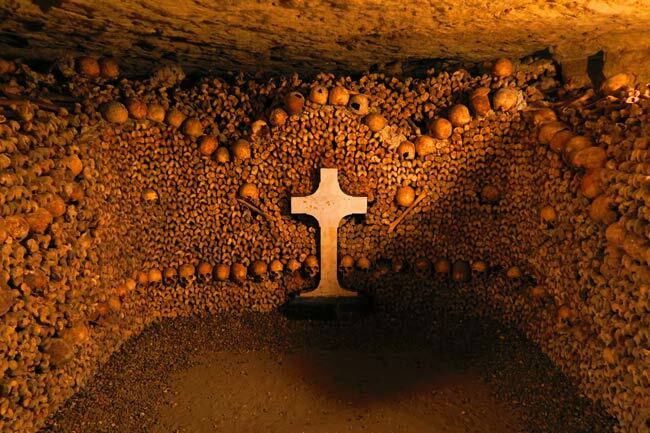 Have a look at this post about visiting the Catacombs of Paris. I highly recommend paying a visit to this special and super interesting place. 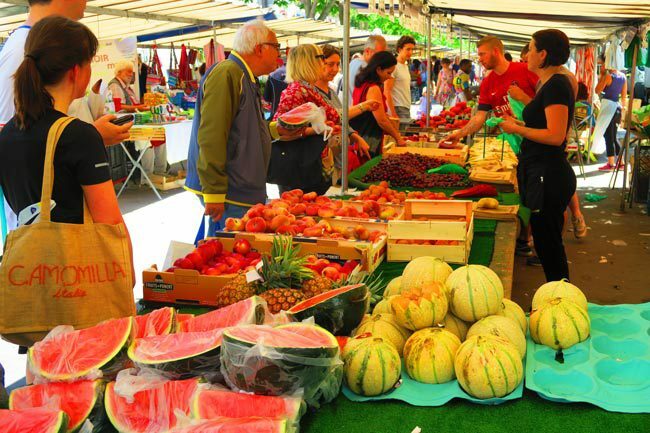 After spending almost two hours underground, you’ll be thrilled to stroll through one of the best open-air food markets in Paris. 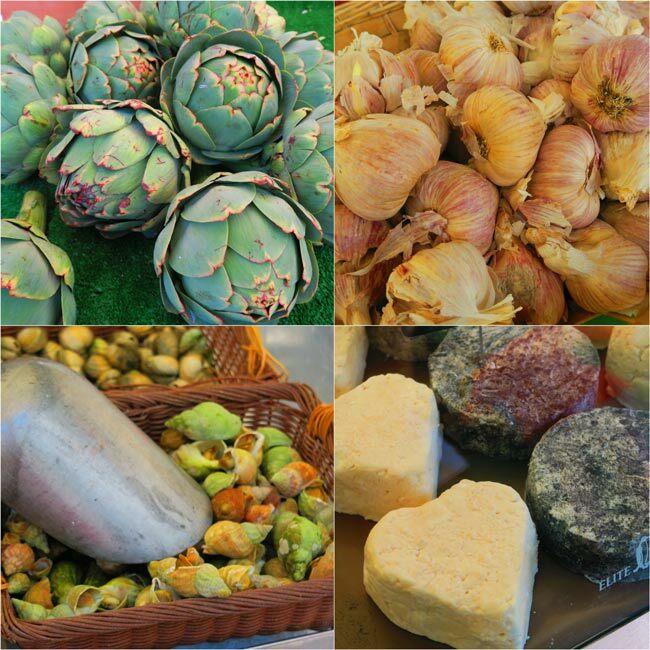 Named after the boulevard that hosts it, every Wednesday and Saturday, the Edgar Quinet Market is where you’ll find some of the freshest produce in town. Sure, there are dozens of food markets around Paris but I found the Edgar Quinet market to be one of the most enjoyable ones to visit. 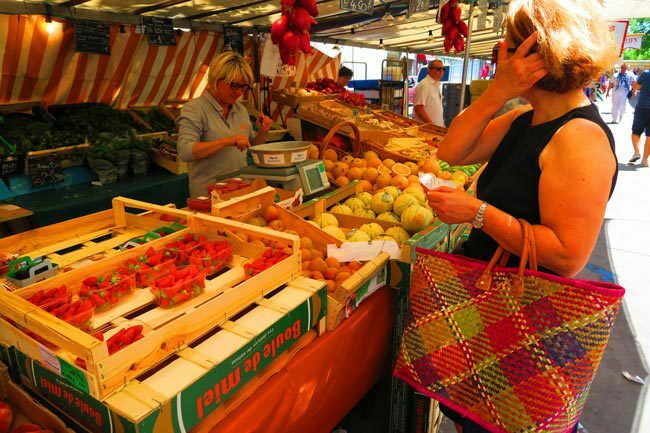 You’ll not only find fresh food here but also clothes and stuff Parisians might need for the home. 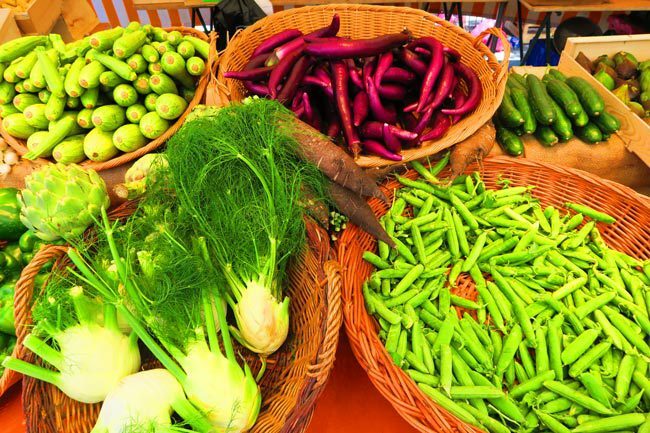 If you can’t make it on the food days, the market plays host to a crafts market on Sundays. 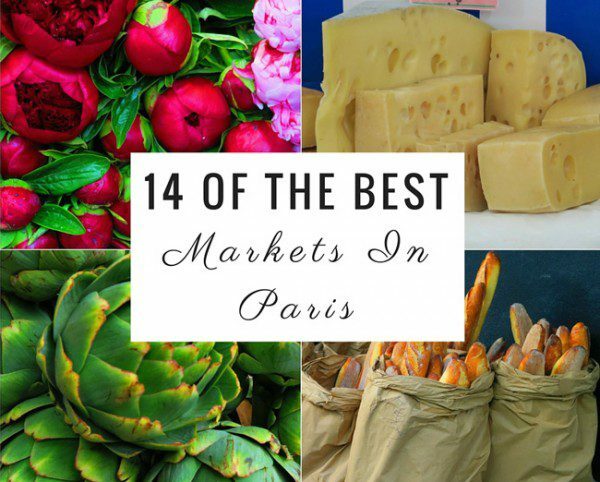 I personally am in love with Parisian food markets but it’s totally up to you. The market is open from the morning hours and until 3 pm though it’s best to arrive before noon as food stalls tend to start packing up at around noon on Saturdays. This could be a good opportunity to buy a snack or better yet, prepare for a small picnic if you’re in the mood. 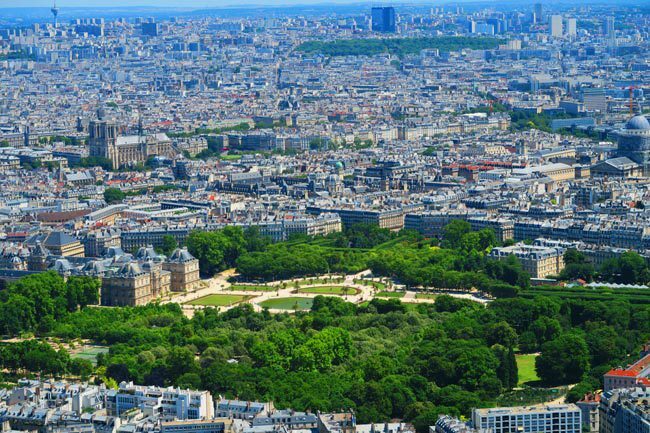 The Jardin du Luxembourg is close by and we’ll be ending the trip further south in Parc MontSouris, if you can hold that appetite. 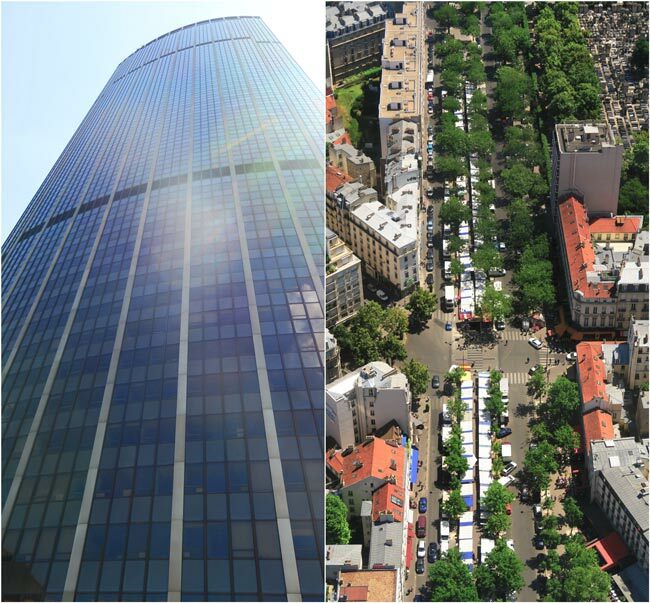 You’ve probably noticed by now the ‘elephant in the room’, that is the Tour Montparnasse (Montparnasse Tower), rising high into the Parisian sky without having anything in common with its surrounding. This was one of the first skyscrapers in Paris (completed in 1973) and even to this day, many Parisians consider it a real monstrosity! There is one ‘plus’ however to having a 59 story, 210-meter skyscraper smack in the middle of one of the most beautiful cities in the world – and that’s exactly where we’re headed now. 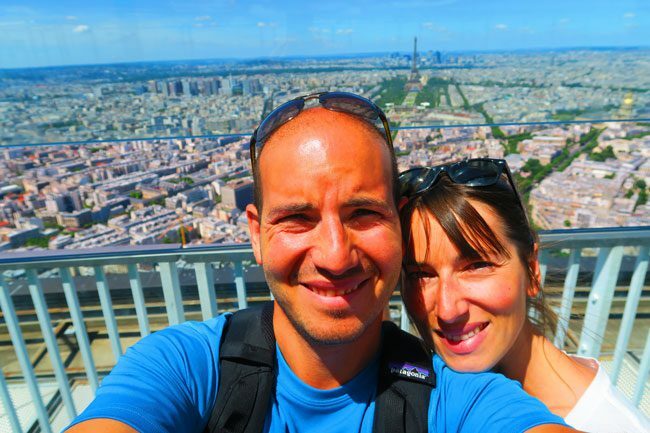 Paris has quite a few spots for catching a panoramic view of town but nothing beats the view from the rooftop terrace of the Montparnasse Tower – believe me, I’ve visited most of those spots. For a steep €17, you’ll join the more than one million annual visitors and ride one of the fastest elevators to the 56th ‘panoramic floor’. There’s a pretty cool collection of photos depicting the history of the neighborhood and the construction of the tower but the real attraction here is the view. 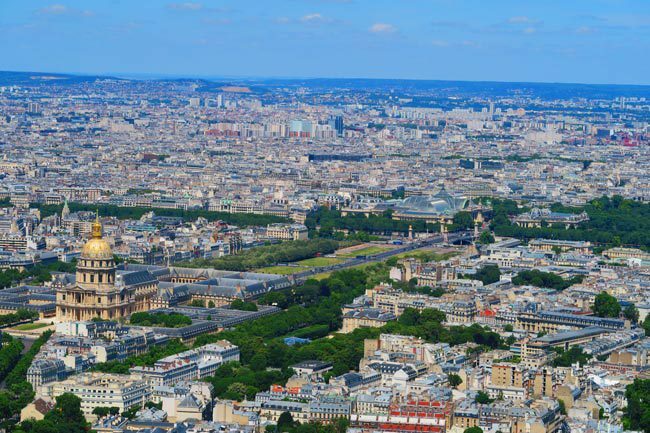 From the panoramic floor, you’ll get a bird’s eye view of the area, but especially the Edgar Quinet market and the famous Montparnasse Cemetery. 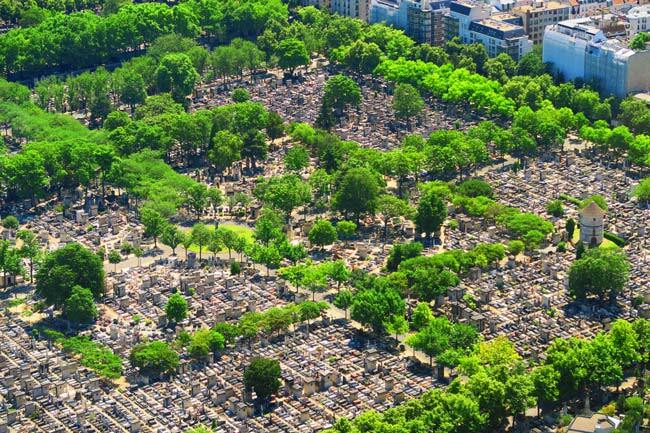 Similar in style to its big brother nearby, the Père Lachaise Cemetery, the Montparnasse Cemetery is the final resting stop for some of the neighborhood’s famous artsy residents. Culinary enthusiasts might want to check out Ciel de Paris, a French restaurant that’s got to have some of the best views in Paris (reservations necessary). The view comes with a price of course but it might serve as a replacement for that €15 ticket to the observation terrace. We found the lunch menu to be somewhat reasonable and in any case, you can either just come here for a drink at the bar or just politely ask the Maître D’ to have a quick look at a unique dining experience in Paris (like we did)! And now for the real highlight – the observation terrace! 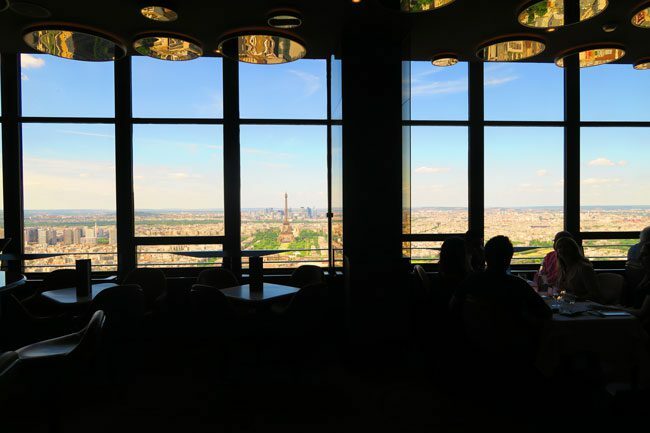 Climb the few flights of stairs from the panoramic floor and you’ll exit at the windswept observation terrace, complete with breathtaking 360-degree views of Paris and a champagne bar… of course. It really doesn’t get any better than this! 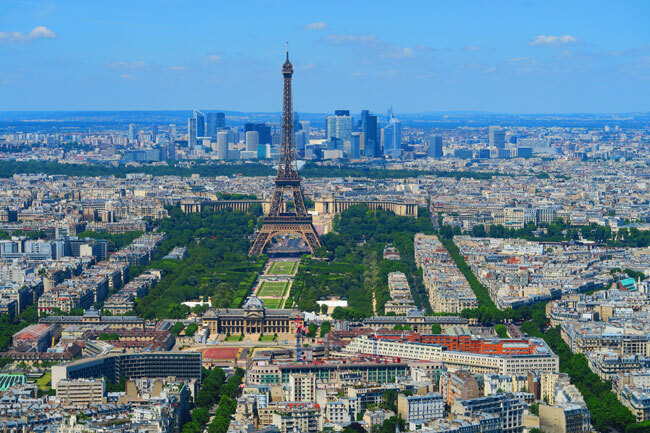 On a clear day, you can see for miles out and if you come for the sunset, the views are simply out of this world as the sun sets in the direction of the Eiffel Tower and Arc de Triomphe. All that wonderful view has surely made you hungry and if you haven’t been munching earlier in the Edgar Quinet Market, have no fear. 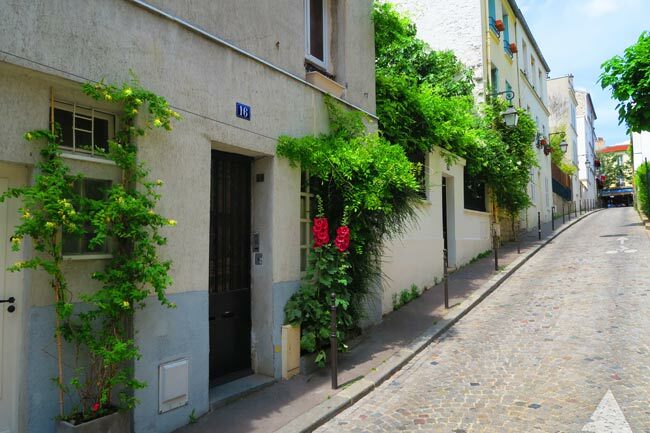 Right next to the Montparnasse Tower is a tiny street that is ‘crepe central’. Paris is dotted with rail stations that historically serve a different part of France. The Montparnasse Station serves the northwestern region of Brittany so it’s only natural that area around the station is geared up to meet the culinary taste of the travelers. And what do Bretons love most? That’s right, a crepe! 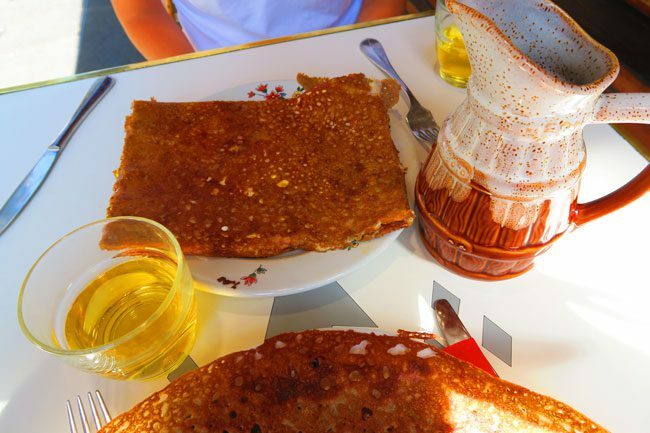 The best place for a French crepe in Montparnasse is in Rue du Montparnasse. Now, it can get super confusing over here as there are dozens of creperies in this tiny street. The best creperie is said to be Crêperie Josselin, where for about €10, you can have an awesome crepe. If you’re already with your mind in Brittany, why not wash things down with a refreshing glass of cider! You can’t stop eating and drinking in Paris so don’t try and fight it – this is totally normal. The good news is that Paris is a city made for walking so we’ll be balancing things out a bit. 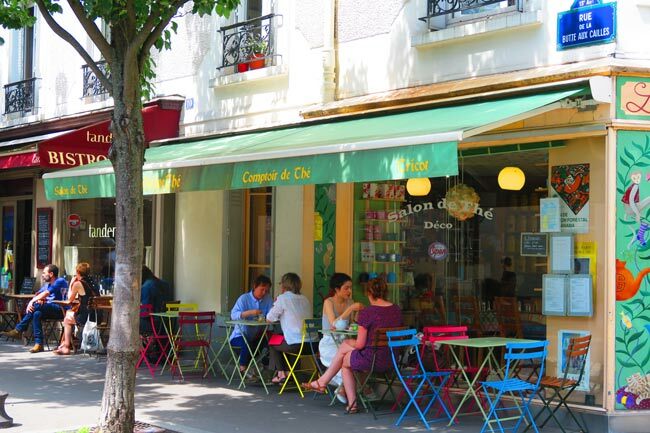 As I’ve mentioned before, in Montparnasse’s heyday, its cafes were the centers of action and really the second home of the creative folks who lived here. Usually quite broke, artists and the likes flocked to the Montparnasse cafes, where they could enjoy the company of others and pass the time over a cup of coffee or beer. It is even known that broke artists paid their bills with their artwork! 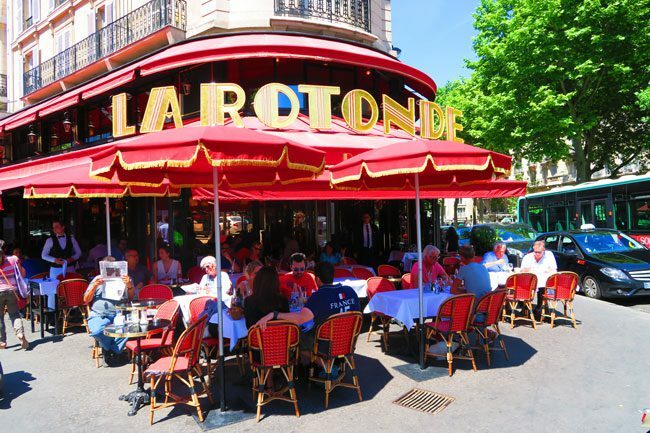 The legendary Montparnasse cafes are mostly centered around the Vavin Metro station: Le Select, Le Dôme Café, La Coupole and La Rotonde – are some of the most famous. Today, nearly all are a lot fancier than they used to be but it’s still super cool to grab a seat inside or better yet in the outside terrace – overlooking the busy Boulevard du Montparnasse and imagining what went on inside these walls almost 100 years ago. 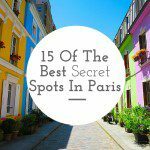 You can certainly still stretch your visit to Montparnasse but we’ve pretty much covered the major highlights. 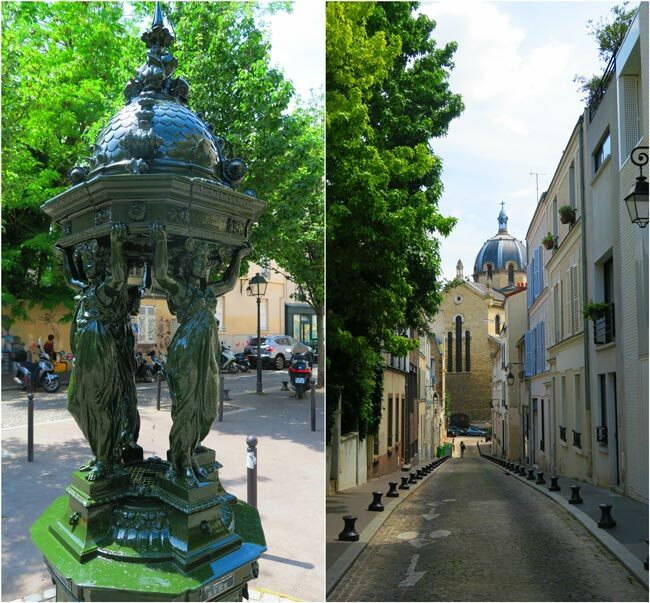 It should be around 2 pm by now and you can either head to Saint-Germain-des-Prés and spend the rest of your day there (it’s my favorite neighborhood in Paris), relaxing along the way in the Jardin du Luxembourg – or, continue further south to explore the small hilltop quarter of Butte-aux-Cailles. If you’ve visited a few Parisian museums by now, especially the Louvre, Musée Jacquemart-André or the Musée national du Moyen Âge (a.k.a Cluny), you’ve probably noticed the gorgeous Gobelin tapestries. The Gobelin family settled in this part of Paris centuries ago and mastered the art of tapestry. You can visit a museum dedicated to Gobelin making on 42 Avenue des Gobelins, if you want to learn more, but I’ll be skipping right along to the Butte-aux-Cailles. Butte-aux-Caille is about a 30-minute walk from the cafe area we just visited (you can also easily hop on the #6 Metro line and get off off Corvisart). 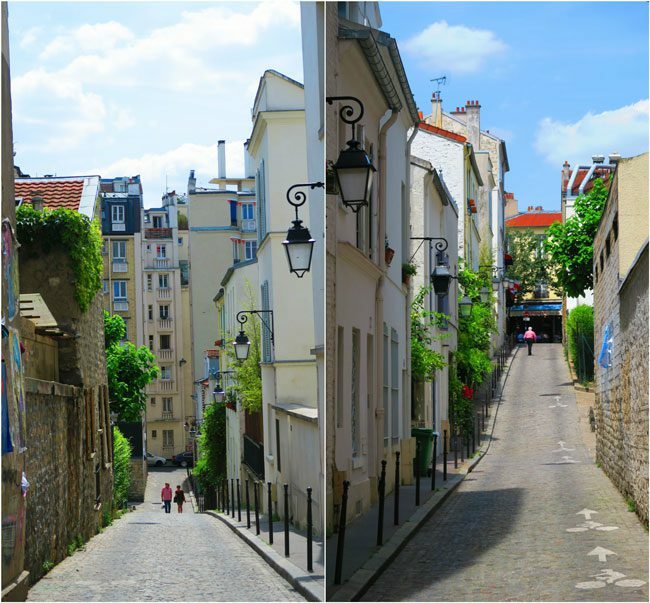 Meaning the ‘Hill of the Quails’, this tiny hilltop neighborhood is also known as the ‘poor man’s Montmartre’. Not as impressive as its twin neighborhood from the north nor as steep, Butte-aux-Caille makes up for that with much charm. You won’t find here loads of tourists as in Montmartre and that’s a huge plus. 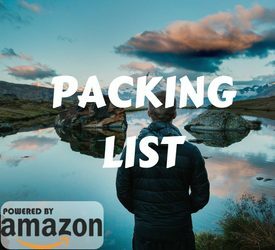 What you will find are charming cobblestone streets lined with classic lamp posts and an easy going vibe. I found the vibe to be kind of a mix between an old-time working class village and modern pockets of hipster central. These two usually don’t mix but they do over here! 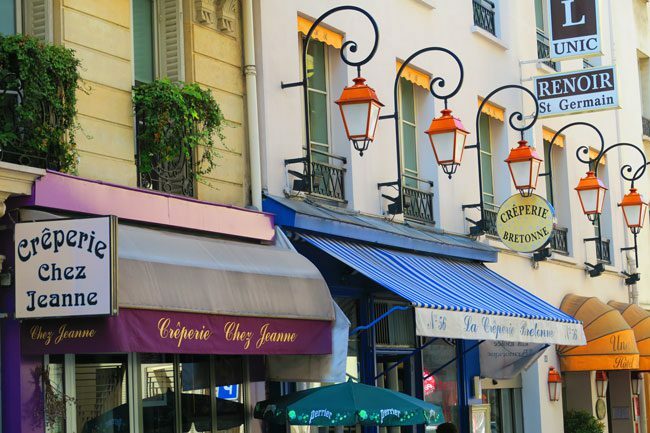 Most of the charm lies in Rue de la Butte aux Cailles, with its handful of bars and restaurants. 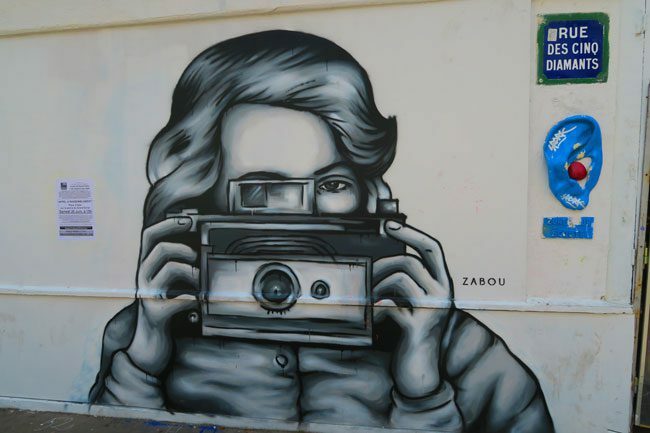 You’ll also want to explore the small alleys that intersect it, especially Rue de Pouy and Passage Boiton. There’s not much else to see aside from this small collection of streets that make up Butte-aux-Caille. The area around it is not the prettiest in Paris but if you’ve been to Paris several times already and want to see something different, you will enjoy this visit. If you can’t make it during the day, Butte-aux-Caille makes for a pretty cool evening out. 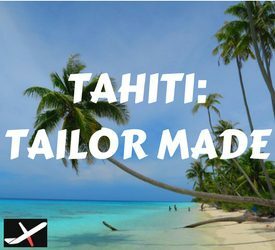 There are lots of bars around here and way more locals than visitors (which is always a good sign). One of the popular spots for cocktails and music is La Folie en Tête over at 33 Rue de la Butte aux Cailles. 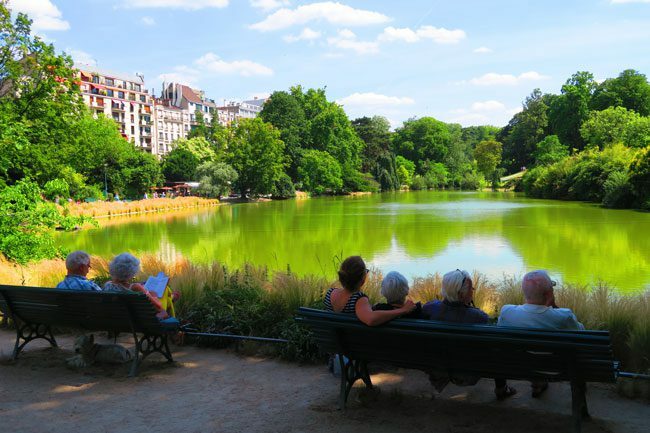 The park itself is dissected in the middle by one of the RER lines but it offers wide stretches of grass to relax on and a lake that makes you forget you’re in the middle of Paris. As is the case with any large park in Paris, it’s best to avoid coming here in the dark but that’s really just common sense around here. 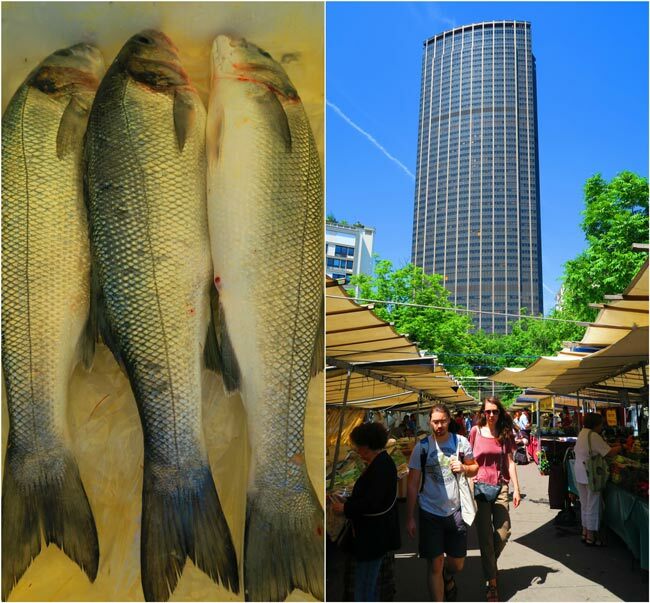 Exploring Montparnasse & southern Paris are not a ‘must do’ if you’re here for the first time. 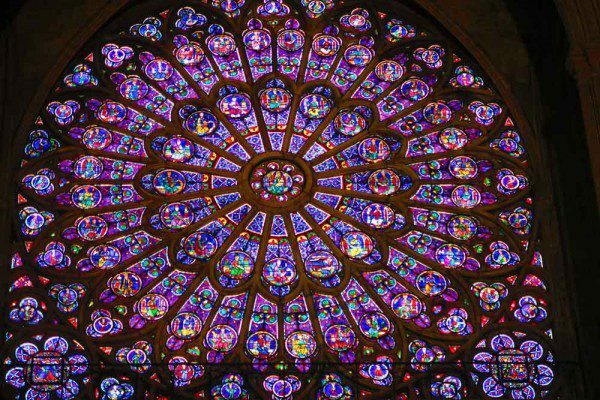 They are more for visitors who are looking to see something else beside the tourist hot spots (and there are plenty of those in Paris). 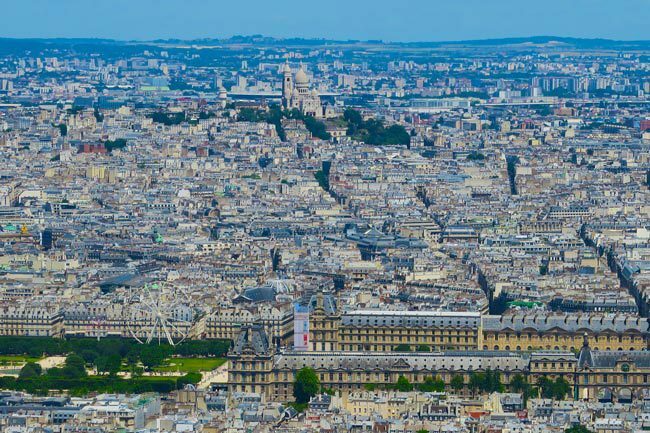 If I had to choose either Montparnasse or Butte aux Cailles, I’d choose the first as it’s more lively and close enough to be combined with classic Parisian neighborhoods closer to the Seine. 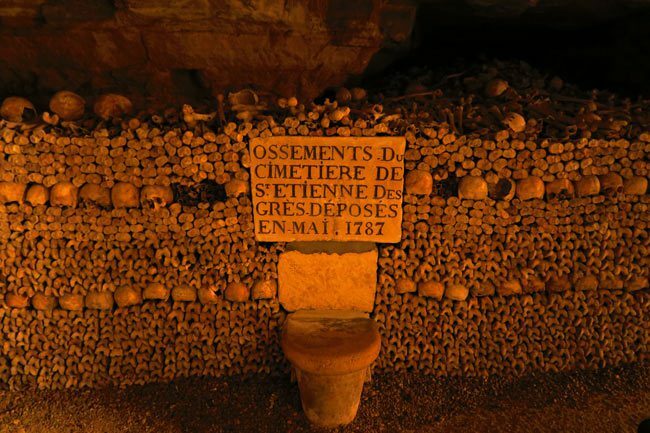 That said, visiting the Catacombs is something I will never forget and I am glad I finally got around to that after a few visits to Paris. With regards to Butte aux Cailles, I would probably prefer coming here for a dinner and a drink. There wasn’t much happening during the day but then again, I had those cute streets almost all to myself.